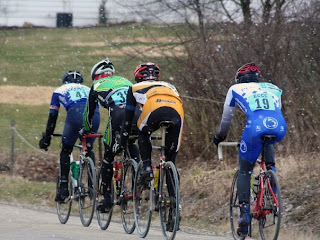 In collegiate racing you race against the same guys week after week after week. It’s cool to get to know everyone’s strengths and weaknesses blah blah blah, but it does get sort of monotonous after a while, every single race there’s the same breakaway that goes away at the same time, and has the same riders in it…boring. This weekend was the big test of the conference, traveling to the East Coast conference to race against the largest conference in the NCCA. Unfortunately the race wasn’t any bigger, number of riders wise, than any MWCCC race. This was a result of Pittsburg being about a 7 hour drive for every school (East and Midwest), Easter Weekend, and yet again the threat of a snowed out race. However small the field was, it’s safe to say that those who were fast from both conferences came out in force. Saturday’s race showcased Pennsylvania’s Allegheny plateau, with several extremely steep leg busters and a generally scenic course. At around a mile into the lap the course took a right turn and went straight up an 18 percent grade for maybe a half a mile, then two more climbs that made you want to cry for mommy, each separated by a narrow technical descent; All that in the first third of the course. After that it leveled out (sort of) until the last two miles, one up and one down, the finish came a half mile after a very steep and fast descent. It was supposed to be a 5 lap race but with the threat of a MASSIVE SNOW STORM they shortened it by one lap (there was no snow storm, they were just behind schedule and I think the EMS guys had to go home). The race started out pretty easy, until the first round of hills that made me want to toss my cookies, gu, and Wendy’s breakfast (that’s what I get for not warming up enough I guess). Through those three climbs two riders got away, I thought it was just that breakaway that nobody cared about and would be caught in a lap. I recovered a bit on the back half of the course. I owe this successful breakaway again to Derek, telling me I should get up with some of the attacks if I was feeling good. 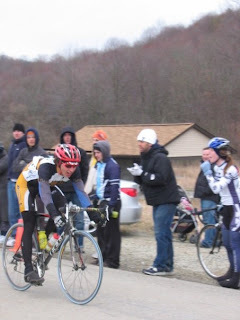 I attacked on the climb before the finish, riding up to a PennState guy who was in the process of dropping a Michigan rider. We really hammered it catching the two riders off the front right at the base of the three steep climbs (closing a minute and a half gap in about three miles). Once we started pedaling up the steepness I sort of came to a sad realization, the riders we bridged up to were not some poor schmucks who we’re leg go, the were actually really strong, and if I was going to stay with these guys I had another two hours of leg burning oxygen deprived riding ahead of me (you know what you have to do but you can still dread it). After the effort of bridging up I spent most of the second lap hanging on to their draft wheezing like an old man. On the third lap another two caught up to us, making the break six: three Penn state, Dartmouth, Yale, and me the odd man out from the Midwest. From there the break went pretty smoothly, except for the Dartmouth guy moaning about how there were three Penn riders and they should tow him to the finish, I was dying and I was pulling, so Mr. ‘I have flowers on my Cannondale’ could pull too…he felt guilty eventually and helped out a bit. On the last lap the attacks started on the three steep climbs. I think people undervalue the mental anguish it takes to get ‘popped’ off the back of a group, I know I do sometimes. Every one of the three climbs I got gapped by all four riders (one Penn guy really got popped), and every time I had a little war between my mind and every part of my body (like a nuclear war inside my legs), after much destruction and casualties, my mind won and enslaved the legs, and I kept the gaps small on each climb enough to catch back on the descents. Everyone was pretty toasted the last 5 miles; several attacks went, but nothing too serious. Everyone kept looking back waiting for the main pack to catch us, I got fed up and yelled ‘hey, let’s not just sit here and get caught, lets work until the last climb’….we had a five minute gap on everyone (haha, oops), worked out though, I didn’t have to coax my cramping legs into accelerating again until the end. On the final climb an Army rider joined us out of nowhere and informed us the pack was a long way back, that signaled the final attacks up the climb, but this time I was not the only one who popped off the back. I lead the second group of three over the crest, and the Yale rider (who actually went to the same high school as me) bridged back the rest of the gap on the downhill. The sprint was so fast that it was nearly impossible to move out of the draft, I ended up 4th. I’m pretty happy with that. I hate to say it but the ECCC sort of schooled us in the road race (in every catagory), I don’t know what happened in the group but I was the only representative in the breakaway from the Midwest and that should not be. Previous Article← All Y’all Goin’ down to Arkansas? mmm the pain cave, where the circuit breaker of pain is located conveniently next to the suit case of courage.